UNODC finally has Human trafficking Database ~ a true Celebration! October 2011 – Human trafficking is a truly global phenomenon and a crime which affects nearly every part of the world, whether as a source, transit or destination country. According to UNODC, victims from at least 127 countries have been identified, and it is estimated that more than 2.4 million people are being exploited by criminals at any given time. More than a decade after the adoption of the Protocol to Prevent, Suppress and PUnish Trafficking in Persons, Especially Women and Children, supplementing the United Nations Convention against Transnational Organized Crime, most countries have criminalized most forms of human trafficking in their legislation. Nevertheless, the use of such laws to prosecute and convict traffickers remains limited. In the 2009 Global Report on Trafficking in Persons, for instance, two out of every five countries covered in the report had never recorded a single conviction for trafficking offences. An added issue behind the legal aspects of human trafficking is a lack of knowledge and understanding at the global level. In those cases in which prosecutions have been undertaken, very little is currently known about them internationally. This often leaves open questions as to how practitioners use the respective laws and what, if any, the characteristics of successful prosecutions are. In a bid to answer these questions, UNODC has developed a database of human trafficking case law to provide immediate, public access to officially documented instances of this crime. The database contains details on the nationalities of victims and perpetrators, trafficking routes, verdicts and other information related to prosecuted cases from around the world. As such, it provides not only statistics on the number of prosecutions and convictions, but also the real-life stories of trafficked persons as documented by the courts. The database is aimed at assisting judges, prosecutors, policymakers, media researchers and other interested parties by making available details of real cases with examples of how the respective national laws in place can be used to prosecute human trafficking. At the time of the launch of the database, more than 150 selected cases from over 30 countries and two regional courts had been uploaded, with an additional 100 cases from over a dozen states to be added in the coming months. 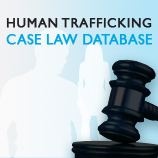 The UNODC human trafficking case law database is available online through www.unodc.org/cld.